SECOND SLICE: AN INSIDE LOOK AT JAPAN’S LEGENDARY $200 SQUARE WATERMELON - What About Watermelon? Gifting fruit isn’t necessarily traditional in the United States, but in different parts of the world, giving fruit is customary. This entry from 2014 explains how giving fruit — especially unusually-shaped fruit — is popular in Japan and should probably become a custom here in the United States! Did you know that in Japan it’s customary for people to give fruit as a gift? It’s not uncommon for someone to present a neighbor with a simple orange or a small bunch of grapes. Yep, fruit is pretty much revered in Japan. Well, maybe not revered, but they do take fruit pretty seriously, and that’s a good thing. They’ve even got high-end “fruit emporiums” where people can buy expensive, perfectly shaped fruits to give as gifts at special occasions like weddings, business meetings and hospital visits. One store sells apples for $21 each, strawberries for $69 a dozen and cherries for $159 per box, but the star product is the legendary square watermelon, which carries a price tag of more than $200. I’ve talked in the past about how the square watermelon are made — essentially, the watermelons are grown inside a special, square-shaped box — but the video below offers a closer look. The most incredible insight from the video: The super-expensive watermelons aren’t intended for eating because most of them aren’t even edible! That’s because they’re harvested before they’re fully ripe. 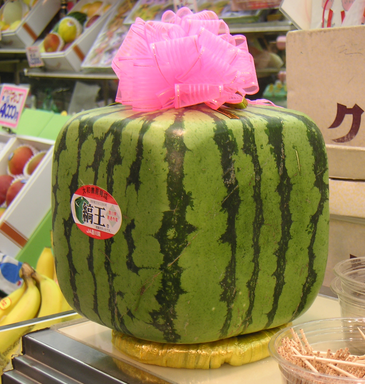 Instead, most proud owners of square watermelon simply keep them as a decorative accessory (they can be displayed for up to a year). I always wondered about the square watermelon’s. I can’t believe that they do this just for decorations. Thanks for the informative post! !